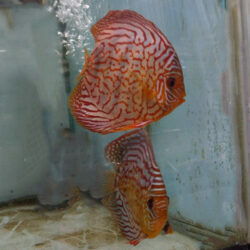 We have healthy discus breeding pairs in all categories available. 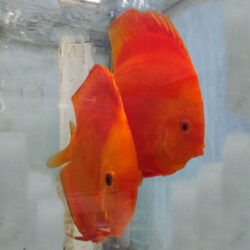 These discus fish are bonded and cycled together to maintain a consistent breeding relationship and are guaranteed to be male and female. Therefore, you can be confident in any breeding pair you choose! 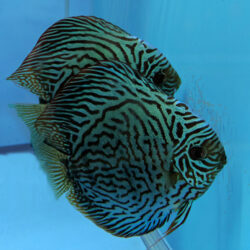 Have a closer look at one of our breeding pairs, the tiger turquoise Discus! When you begin your journey into discus breeding pairs, there are a few things you should keep in mind. Most of all, the biggest piece of advice we can offer anyone is patience! 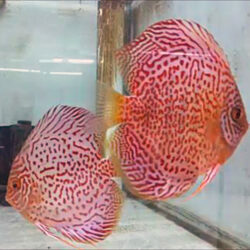 A well conditioned discus breeding pair will breed over and over again, until they have a successful spawn, so if there are any complications, don’t worry. Normally with in 5-9 days they will spawn again.